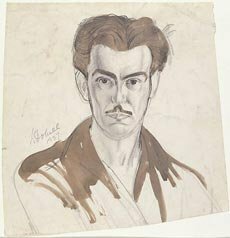 Support for a drawing prize by the Sir William Dobell Foundation is particularly apt because of the importance William Dobell placed on drawing. Drawing was the foundation for all his art – it was his way of forming and developing ideas, and how he came to realise his intentions in paint. Dobell’s early inclinations and training had led naturally to drawing. The Sydney Art School (later renamed the Julian Ashton Art School), where Dobell received his first instruction, was renowned for its focus on drawing from life. Distinguished alumni, particularly George Lambert and its founder Julian Ashton, had left their mark on the school in their focus on drawing. The school’s approach echoed that practised in many schools in Europe and England, emphasising the linear rendering of form. An understanding of anatomy was expected, though not formally taught – drawing from observation was of foremost importance. London’s Slade School also had a reputation for excellence in drawing, and a similar regime for teaching it. Henry Tonks, who taught Dobell there in 1939, was one of the school’s most celebrated teachers of drawing, and instilled a disciplined approach that incorporated drawing from casts of antique sculpture and from life and the study of anatomy, so that students acquired sufficient skill from which to develop their individual vision as painters or sculptors. Dobell continued to focus on drawing for the remainder of his life, stating from time to time that it was essential to his work. For Dobell, quickly executed sketches were his means of capturing observations of a subject on paper, as an aide-mémoire. He mostly drew his subjects from life, often from several angles. Observation and memory were combined in drawing before he was able to elaborate upon his initial impressions in paint. Drawing was a way of solving visual problems and understanding his subject, grasping it before he developed it into a final composition. The majority of his extant drawings seem slight at first sight. They are often on scrappy pieces of paper, occasionally using poor materials and in some cases creased and worn, indicative perhaps of the urgency of their creation and the frequency of their use as references. Further study, however, reveals them as critical to the conception and development of Dobell’s subjects. Drawing was for him a private activity – very few of his drawings were intended as finished works in their own right – rather they were his way of understanding his subjects and realising his ideas pictorially.